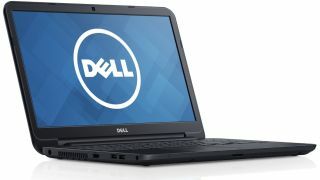 Dell has added another SKU to its popular Inspiron range and unlike previous models this one is likely to get heads turning because of its price. At £179 including VAT and delivery, the Inspiron 15 3531 is by far the cheapest Windows 8.1 laptop (and indeed computer) on the market - and one that doesn't cut corners. As expected, Dell opted for Windows 8.1 with Bing which serves Bing and Internet Explorer as default search and browser respectively. The rest of the configuration is not too shabby either. There's a dual core processor (an Intel Celeron N2830), 4GB of RAM, a spacious 500GB HDD and a 15.6-inch display. There's no optical drive and no USB 3.0 ports (only a pair of USB 2.0 ones), but you do get a spill- resistant keyboard, HDMI and 802.11n wireless connectivity. The lack of drive and a smaller 40Whr 4-cell battery means that this laptop, despite a big screen, is surprisingly light at 2.12kg - lighter than some Ultrabooks. Dell also bundled a one-year next business day warranty with premium phone support and 20GB Dropbox cloud-based storage for a year. A few days ago, Microsoft outlined a new strategy that would see more value Windows-based laptops pitched against Google's Chromebook.